Owing to the most simplistic interface and abounding themes & plugins in WordPress, it may be the first website platform that comes to your mind when planning to start a website. There are abundant numbers of multipurpose themes as well as niche-based themes with which you can easily create a website. However, not all themes are fast. Choosing the fastest WordPress themes from the overloaded ocean of themes and templates is definitely not an easy task. So, we have tested the best of the themes from the list of multiple categories/ niches so as to provide you with the most fast-leading WP themes. Before we proceed to the list, let me briefly discuss why website speed is important. Why Website/ Page Speed Matters? Kissmetrics Blog states, 40% of people abandon a website that takes more than 3 seconds to load. Yes, it’s just 3 seconds. No one waits! Why wait? There are many more websites offering similar kind of content as you do so there is no point waiting for a sluggish site to load. So if you want the people to stay on your site and see the content you are offering, your site needs to be fast. The bottom line: Speed increases website engagement and reduces bounce rates. Further, there are advantages of this. More the people stay on your site, more the sales will increase. Thus, enhanced page loading time can largely enhance site conversions. Thus, the first and direct benefit of optimizing website speed is ‘increasing website engagement and increasing conversions. Second, page speed is a key SEO (search engine optimization) factor. The most popular search engine Google included page speed as an important signal in its search ranking algorithms in 2010. This is to say that fast-loading websites rank higher in Google’s result pages in comparison with the slow ones. In addition, Google has made an announcement that page speed will be a major ranking factor for searches starting from July 2019. With the increasing number of people using mobile phones for web browsing, making your site mobile responsive has been a must. Mobile speed optimization is equally important now. Similarly, Bing also updated its Webmaster guidelines in 2012 and stated that page speed impacted Bing’s search rankings. The case is similar to other search engines like Yahoo!. Thus, we can conclude that speed is the key to a successful online venture. WordPress Speed Test – How did we test themes? Speed being a very important measure determining SEO and overall success of websites, the speed test is something all website owners would be interested in. Luckily there are many free tools for website speed testing available online. Among all, Google PageSpeed Insights, Pingdom Website Speed Test, GTMetrix, YSlow are widely used. For this post, we have used Pingdom Website Speed Test tool. Pingdom is an easy to use and efficient tool for website speed test. The tool is very useful as it provides an overview of your website performance along with performance grade after examining all parts of the web page. Besides, it allows you to check how fast your website loads from multiple server locations. Main demo website of each theme is tested using this tool and the ordering of the themes is made based on the results. We have carefully analyzed Pingdom’s speed test results with major concern on the performance grade, loading time, page size, number of requests. We have mentioned only the themes with good performance grade, lower loading time in relation to the page size and fewer load requests. Note: The theme’s speed is not the single most factor that determines the website speed. So, only use of a fast-loading theme cannot guarantee a speedy website. There are actually several factors influencing website speed including hosting, page size, content, number of plugins, etc. You must take care of them all including the selection of a fast-loading theme for a speedy website. 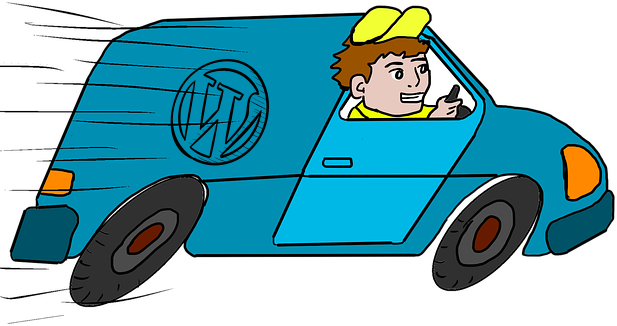 If you wanna learn the WordPress speed optimization, here are quick tips for you. Let’s explore the handpicked list of fastest WordPress themes for 2019. Vlogging is trending; people nowadays prefer sharing blogs in video forms. If you are one of them, Vlog is a perfect pick for you. The theme supports YouTube, Vimeo, Dailymotion and many more video hosting sites where you can upload your videos and add them to your blog. You can beautifully showcase your videos and inspire more people to start video blogs. Vlog theme has a beautiful layout and responsive design so that your site looks amazing on all types of devices. In addition, the theme has a number of custom layouts and design options to let you create a design like you want. The performance grade of Vlog theme is WOW! Video themes are usually considered slow-loading but this theme is an exception. The Google page speed based site performance is 99 out of 100 and the page loads faster than 84% of tested sites. That’s just amazing. A Complete video theme – automatic video import from YouTube & Vimeo, group videos into playlists, auto detect video thumbnails etc. 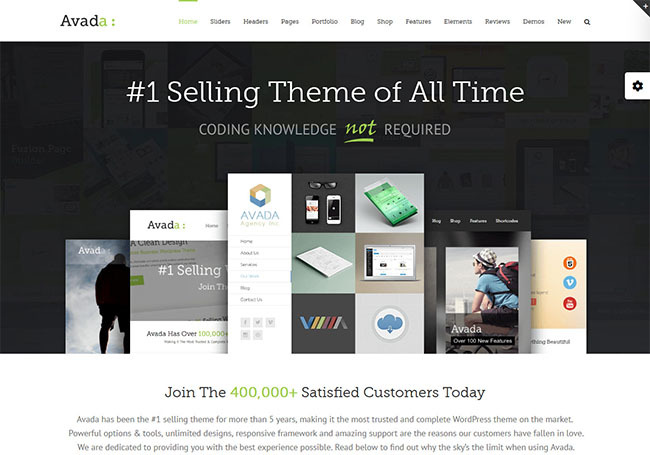 Avada needs not any explanation as the name speaks for itself – the best-selling theme ever trusted by over 400,000 people. It is a multipurpose WordPress theme which is powerful enough to let you create a website in any niche. Yeah, this theme can be your companion to start a business website, blog, eCommerce site, education, photography, dentist, music or any genre you can imagine. The theme offers 6 premium WordPress plugins included in it for free those are worth $200. Besides, the reliable and dedicated customer support they offer is a key factor behind the massive success of the theme. Avada is the king not just for its unlimited customization options but also for its highly optimized speed. When we tested the ‘Avada Classic’ demo, it performed really well. The theme got 94/100 performance grade, 3.70 seconds loading time, and was faster than 43% of the sites tested. 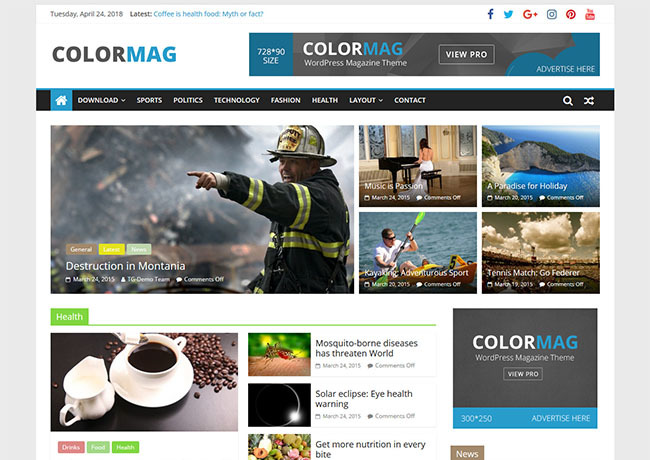 ColorMag is the #1 free WordPress magazine theme in the official theme repository, the only theme in magazine niche with over 100,000 active installs. The theme has remained in the popular category ever since its release back in 2015. Unquestionably so, the premium version of the theme is the best-selling theme of our company ThemeGrill. Loved by thousands, the theme ensures high-speed and grandeur performance. The theme comes with multiple ready to import demo sites which are unique and elegantly designed. You can instantly import the demo data and then replace the demo content with your original data and get a site ready in a matter of minutes. Simple and user-friendly interface and plenty of magazine-focused features make the theme an ideal pick for anyone willing to start an online magazine. As you can see above in the screenshot, the theme’s main demo loads in 1.39 seconds. That’s less than 2 seconds. The demo site is faster than 82% of the tested websites on Pingdom and the performance grade is fair as well. Responsive magazine-style design – the theme has a magazine-focused design that looks great on all types of devices, screens. 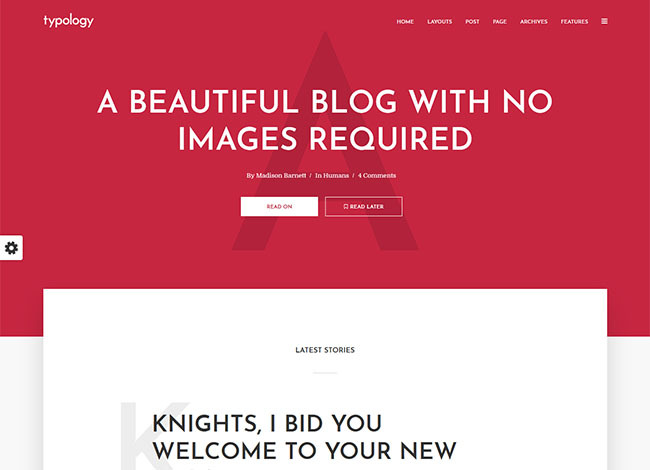 Sydney is a fermium theme that has both free and premium versions. 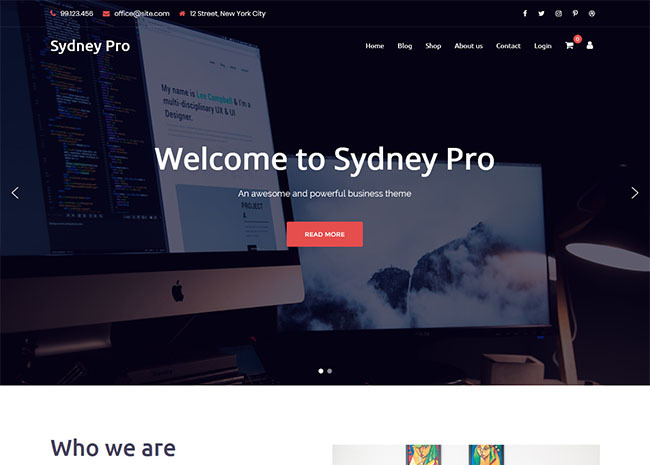 The free Sydney theme is one of the most popular free themes at the official theme repository with over 200,000 active installs. The theme is created by the professional developers at aThemes with a lot of love and care. It is suitable for business and corporate sites as well as creative agencies. The theme is fully responsive and easy to use. WordPress beginners with low or no coding skills can easily set up, customize and build full-fledged business sites using this theme. When it was tested with Pingdom website speed test tool, the result was impressive. As shown in the image attached below, the performance grade was ‘A’ – 92 out of 100. The loading time was less than 2 seconds and it was faster than 73% of websites. 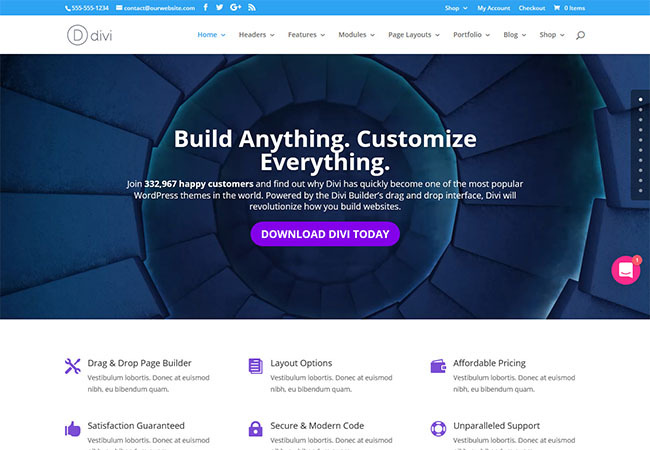 Divi is a very well-known name among WordPress people; it’s another very popular WordPress theme. Loved by thousands of users, Divi is the stellar product of Elegant Themes and a reliable name in the industry. It’s a truly multipurpose/ multi-niche theme which has plenty of features and customization options that allow users to build a website like they want. The theme is powered by the drag and drop page builder plugin Divi Builder. Divi theme offers limitless design opportunities with a bundle of design elements & modules, layout templates, header, and footer options. Even more, the theme is fully responsive so as to fit any type of device and size of the screen, SEO optimized and speedy. There are multiple pre-made theme demos however we tested the main demo site on Pingdom. The result summary is just above. The 4.0 MB page data loads in just 1.15 seconds which is really impressive. Further, the site is faster than 86% of the tested sites. Import & export – Import the premade layouts or create new layouts, save and export. 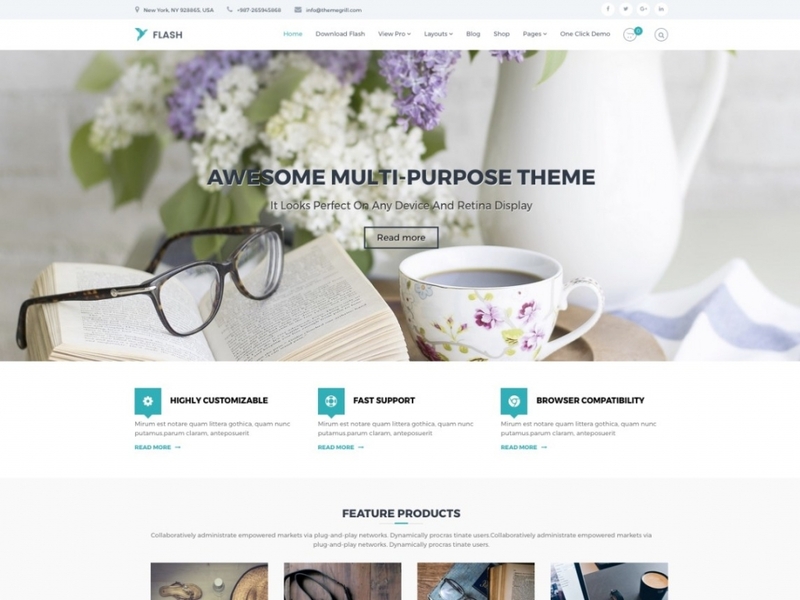 Flash is yet another popular free WordPress theme that has been loved by thousands of users/ website owners. The theme has received overall 5 out of 5 stars in the official theme repository WordPress.org. The theme features a beginner-friendly simple user interface along with a professional-looking design so that users can easily and instantly create websites that look professional. Just as it’s beautiful, it’s efficient and fast-loading theme. It’s a multipurpose theme which is suitable for all types of business websites. The theme is available in both free and premium versions and there are multiple pre-made stunning demos with one-click import option. We tested the main demo for the free version and the result summary is just above here. The theme loads in just 1.87 seconds and in 77 requests. The site speed is great that it’s less than 2 seconds. The demo site is faster than 73% of the tested websites. Live WordPress Customizer – Live preview all the changes you make on your site. Advanced color options – change the colors as you like. 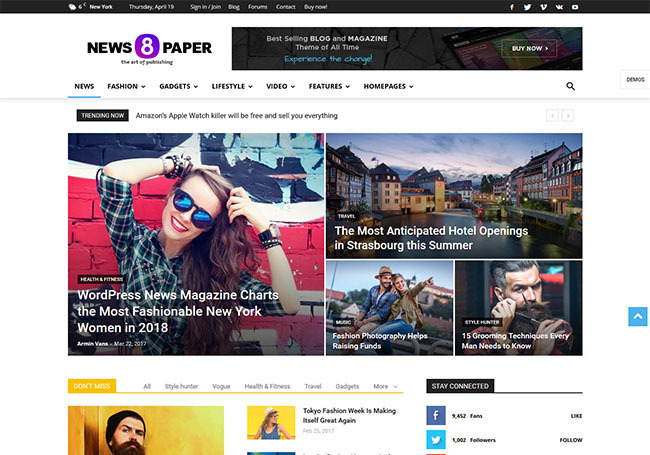 Newspaper is another best-selling theme on ThemeForest. The most popular theme in the magazine/news category, the theme is trusted by over 60,000 users and the user reviews are great as well, i.e. 4.8/ 5 stars. The theme provides a stunning design for online magazines, news websites, and blogs. The theme features YouTube integration, rating system, bbPress forum, BuddyPress support, WooCommerce etc. so as to let you all the functionalities you need on your site. Newspaper theme is fully responsive so that your site content looks great of all devices regardless of screen size and resolution. The theme is simple and highly intuitive so anyone can build a site without touching a single line of code. The secret of the Newspaper theme lies at its well-structured, SEO optimized and high performing design. When we tested the default demo, the performance grade was 93 out of 100. The demo site loads in 2. 22 seconds and it is faster than 66% of all websites tested. Customize limitlessly – tagDiv Composer plugin built-in to offer your amazing page building experience from the front-end. Mobile-ready – it’s more mobile than ever with Google AMP’s full power. 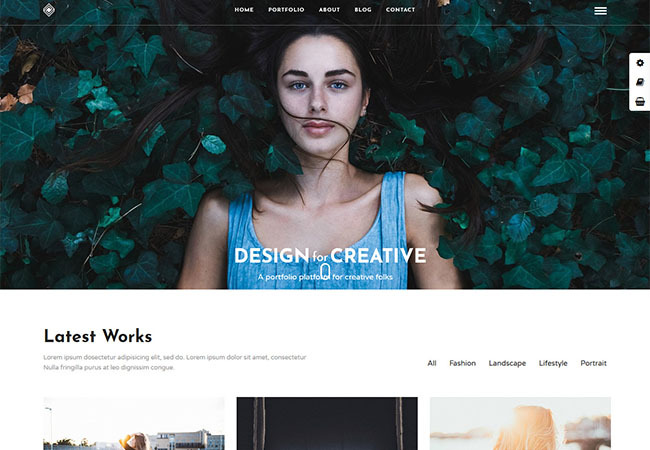 Just as the name suggests, Photography is an amazing WordPress Photography theme with a responsive and creative interface. It allows the user to create stunning galleries to display your works of art. Probably the fastest photography theme out there, it is fully responsive and retina ready. With regular updates, this theme is yet another best rated and best-selling Photography theme on ThemeForest! With tons of demos to get you started, it takes only under a minute to import them. Crafted with great attention to detail this theme is best suited for Photographers, designers, artists or any creative minds who wish to share their work online in a stunning manner! Another amazing performing theme as tested by Pingdom! 99 out of 100 Performance grade is nothing to be joking about. As tested from the New York City, Photography seems to load 2.90 seconds faster than other 54% websites. One Click Demo Import- Import pages, images, menus, sliders within a matter of minutes. WooCommerce compatible- Sell your artworks, paintings, and photos with direct purchase links. Client Proofing- Let your users approve or reject images within a gallery. Progressive Image Loading- Load only the images your users are looking for. Premium Lightbox Included- Lightbox plugin and Modulobox Plugin included. Grand as its name is, Grand Portfolio is a wonderful theme for creating impressive portfolios. Not just powerful and highly customizable to let you create an online portfolio as you want, it’s one of the fastest WordPress themes ever. 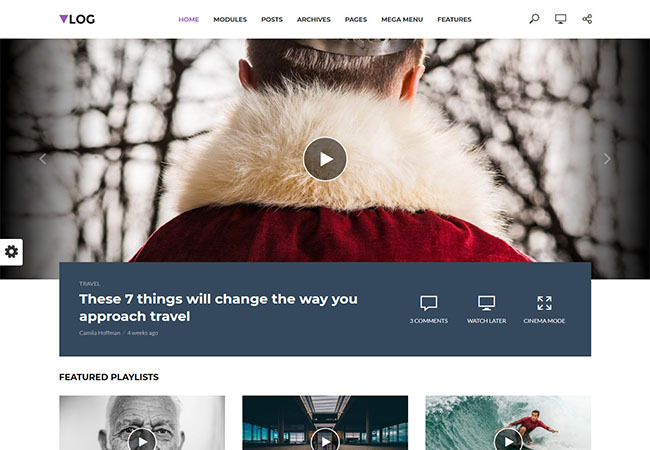 Probably the best-selling portfolio theme at the ThemeForest marketplace, the theme flaunts over 1800 sales and 4.36 average user rating. The theme is portfolio focused and created for all the creative people. It suits best for creative agencies, fashion designers, bloggers, photographers, architects, singers and anyone who want to showcase their work. WOW! It’s 99 out of 100 – the performance grade is just amazing. The tested page loads in about 3.5 seconds and faster than 44% of the tested sites. The theme demo was tested from the server located in New York City, USA. One Click demo import option – import pages, posts, images, menus, sliders, theme settings etc. Infinite scroll – keep your users engaged with amusing pages with infinite scroll. Shop support – Powered by the official WP e-commerce plugin WooCommerce. Live Customizer – Preview as you build, be speedy and smart. Minimal, clean and unique, Typology is a stunning WordPress layout for writers, bloggers, and authors. With a beautiful and elegant feel to it, this theme is focused more on the text content than the media files. A unique way to showcase your literary skills, Typology is sure to make your website stand out from the crowd. Fully responsive and offering tons of amazing features, this template is the answer to all your minimal needs. Take control of the typography and choose from the range of fonts available. Fine-tune each and every aspect and get the perfect end result! Superb! Typology has been graded 97 out of 100 for its performance. Tested with Pingdom from New York City, Typology is yet another Fastest WordPress themes on our list. Loading in 815 milliseconds, faster than 92 % other tested websites. Text-based WordPress theme- Focused on beautiful typography and well-written content. Tons of typography variations- full control over fonts, text size, and font colors. Branding- Dedicated sections for logo and icons. WooCommerce support- create online shops with ease. 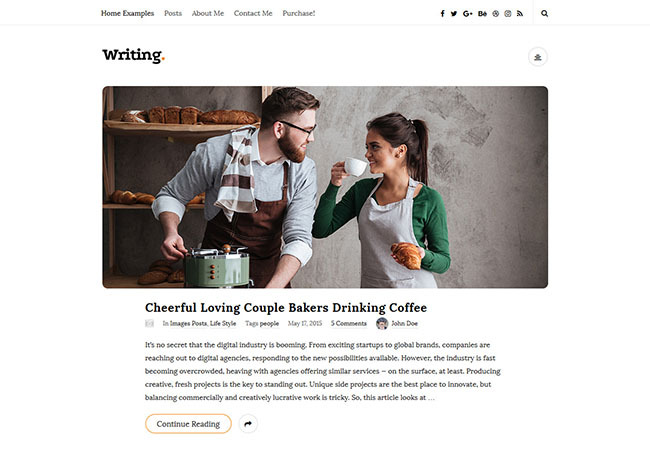 Writing is a clean and minimal WordPress blog theme best for creating personal blogs. A cost-effective theme available for just $49 is one of the most popular premium WordPress blog themes at ThemeForest theme marketplace. The more interesting thing about the theme is 4.8 stars average ratings out of 5 stars. The theme is created with utmost care for the ease of use and simplicity. The theme is extremely easy to use so that anyone without any coding skills also can create a complete blog of their own. The theme has performance grade of 97 out of 100. The tested theme demo took just 1.93 seconds to load! That’s amazing actually. The theme demo loads faster than 71% of the tested websites. 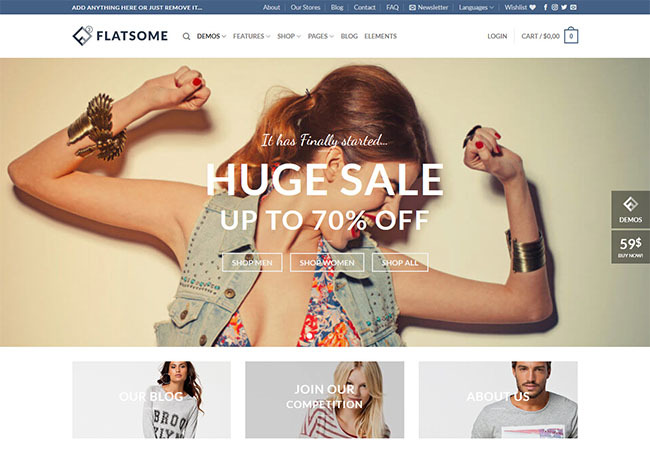 Flatsome is the #1 best-selling WooCommerce theme at the largest theme marketplace ThemeForest. The theme has deeper integration with the eCommerce power for WordPress ‘WooCommerce’ so as to provide users with the best possible eCommerce features. It is beautifully designed, powerful and speedy as the website visitors would love to see an online store be. The theme offers a wide range of customization options as it integrates a powerful live page builder and a large element library. More than that, it has 300+ pre-defined layouts and sections which you can simply use by replacing the demo content with your own content. Flatsome is AWESOME! Not just awesome features, the theme has an awesome speed as well. When we tested the ‘Classic Shop’ theme demo with Pingdom, the site performance was 95/100. And, the demo site loading time was just 2.29 seconds. The theme demo site loads faster than 64% of the websites tested on Pingdom. 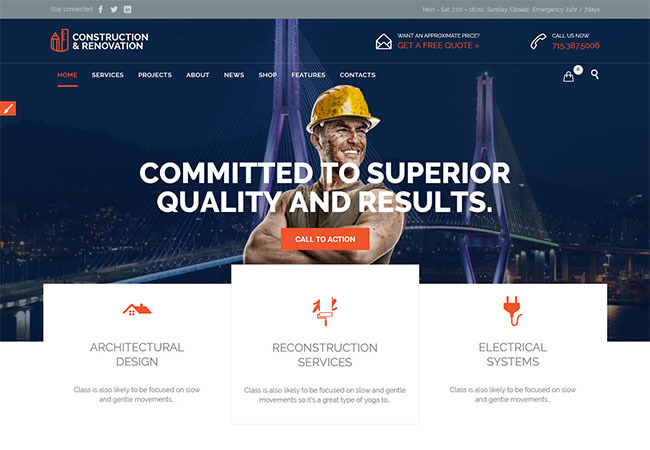 Construction is probably the best WordPress construction theme which has made more than 3000 sales and 4.5 average ratings. The theme is suitable for building services, architecture, engineering, cleaning service and all types of construction related services. Besides, the theme is suitable for small and big businesses and agencies. The theme is feature-rich and highly customizable to meet your any type of needs. Options to add opening hours, free consultation and appointment form, practice areas, case results, Q&A and team members pages make this ideal for business sites. We tested the theme’s main demo with a clean layout, the demo performed great. It has 95 out of 100 performance grade. The loading time was 2.15 seconds and the demo loads faster than 67% of the tested websites. The themes listed in this article are carefully handpicked to help you make a quick decision so I am hopeful hearing your comments after using the themes. Because speed is something we as the website owners cannot ignore, we have taken our extra efforts to test themes and write the reviews. We have included only the themes which performed well on Pingdom’s Website speed test – good performance grade, less loading time in relation to page size and fewer load requests. In case you are already using any of the themes, you can write your experience in the comment section and help others. Also, let us know any theme that is fast-loading but missed in this article. We would definitely add them in the next updates. ← What is Semantic Search and Why Do You Need It? I use newspapper, that really fast and responsive template for mobile.